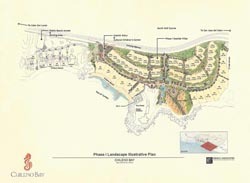 The six partners of Chileno Bay Club are thoughtfully developing a unique private club community with a lasting legacy on the best stretch of land on the Cabo San Lucas Coast. 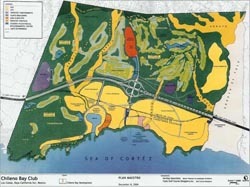 A portion of the land was previously home to Hotel Cabo San Lucas, the first luxury resort in Los Cabos where moguls and Hollywood superstars like John Wayne flew their planes into the resort’s private airstrip. Chileno Bay Club is located midway between San Jose del Cabo and Cabo San Lucas, approximately thirty minutes from the Los Cabos International Airport. At the southern tip of Mexico’s Baja Peninsula, Chileno Bay Club overlooks the shimmering Sea of Cortez from two-and-a-half miles of pristine coastline and nearly 1,300 acres of richly textured landscape. 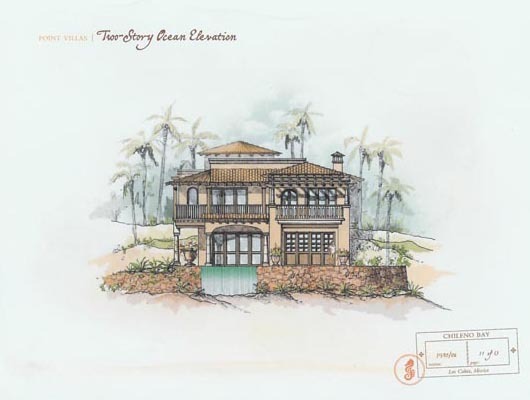 From villas to ocean estates, an array of residences will be offered at Chileno Bay Club. Customary outdoor living and Spanish colonial architecture will capture the essence of casual elegance. The project, broke ground in 2006, will feature a private marina and yacht club and hill town inspired by the beauty of Portifino, and one of the only calm swimable bays in Cabo, shielded by a natural reef. 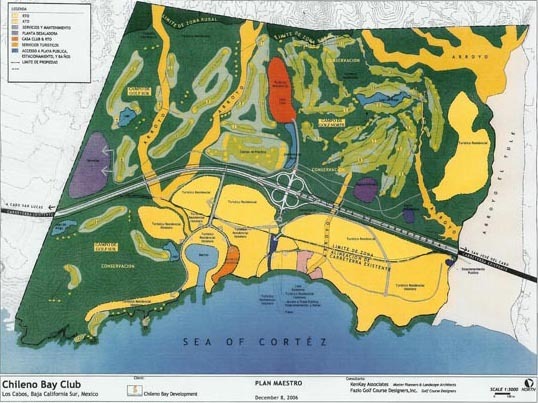 The development will also feature two Tom Fazio Championship golf courses. 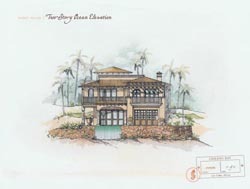 A unique manifestation of quality and vision of Chileno Bay Club, each Villa will be individually designer to suit the topography of its site, oriented to the best ocean views, and constructed with attention to every detail. 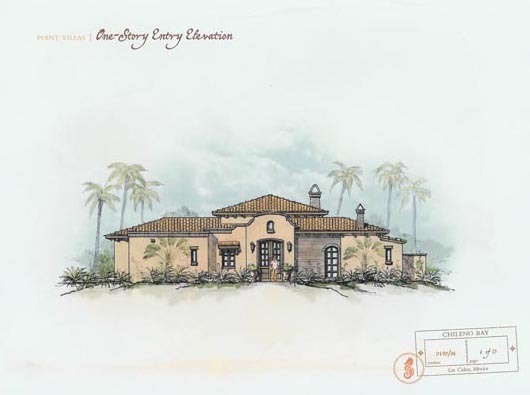 Villas will feature open floor plans with tiled courtyards, private pools, and outdoor showers to take advantage of the comforts of the Los Cabos climate and highlight the joys of traditional Mexican indoor-outdoor living. 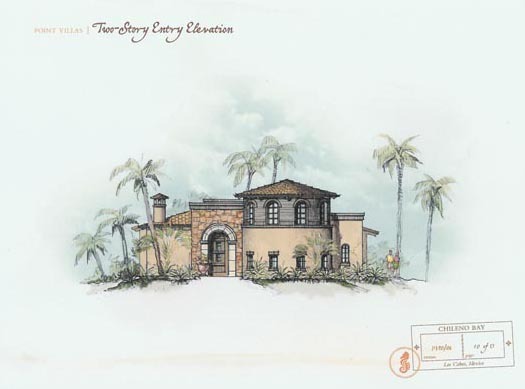 Private garden spaces will be veiled by a diverse selection of lush tropical plants, vines and flowers, and other custom landscaping details including privacy walls, traditional Mexican fountains, and wrought-iron entryways. 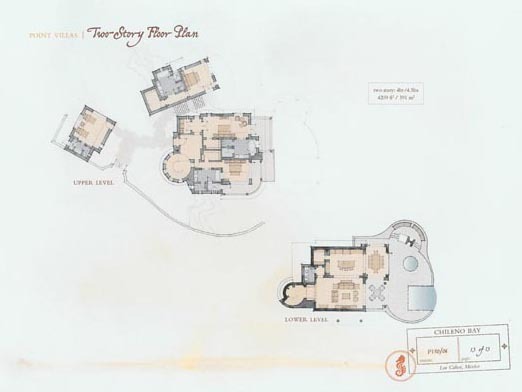 Many Villas will be free-standing units in locations throughout the property. In some cases, Villas will be attached in low-rise, low-density clusters designed to create lively neighborhoods and centers of activity. 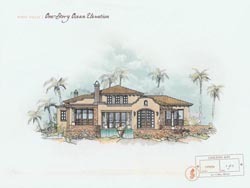 Unique seaside residences in a style reminiscent of old world villages in Colonial Bay. 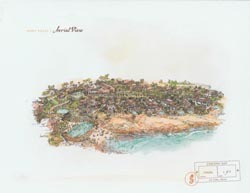 Terracing dramatically down the property's northern promontory towards the Sea of Cortes, the Point Villas and their detached casitas create a community, which appears to have been constructed organically over many years time. 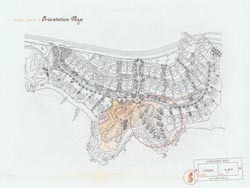 Each Point Villa is arranged specifically to address unique characteristics of its individual site and the overall project composition. The architectural materials of these surrounding environment; an integration of brick, stone, and wood in unique combinations further reflect this exclusive neighborhood's historically rooted design philosophy. Each site is designed to maximize living area, inside and out. 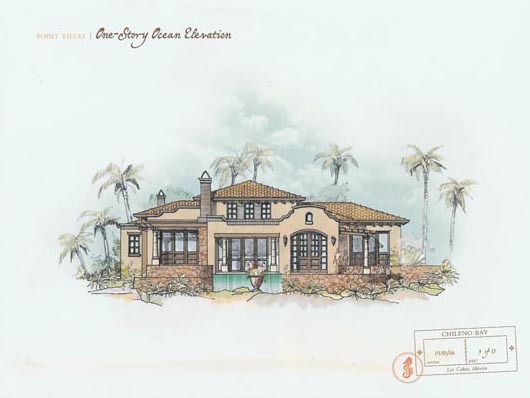 Indoor living rooms open up completely to outdoor living rooms, courtyard garden spaces, and ocean side patios, minimizing transitions between interior and exterior space to create one complete, exceptional living environment. Tiered on a rocky promontory reaching out into the Sea of Cortés, a small gathering of Chileno Bay Point Villas enjoy spectacular ocean frontage, powerful views, and an architectural design entirely unique to Los Cabos. 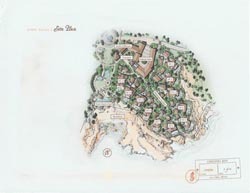 A total of 11 seaside villas, each designed in a site-specific manner with extreme care taken to maximize views, privacy, and the unique qualities of each property, form the unique seaside enclave that is the Point Villa neighborhood. The Point Villa neighborhood includes six one-story unites and five two-story units. 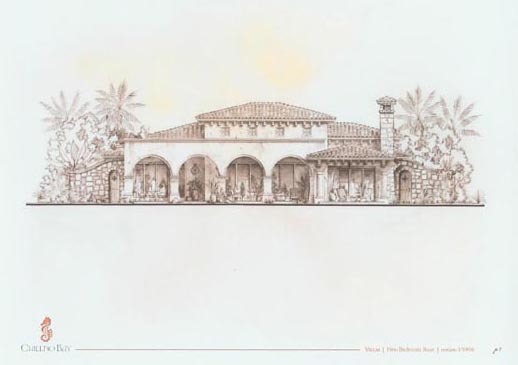 A common garage called the “Vehicle Stable,” designed in the tradition of old Hacienda horse stables, will provide sheltered parking for all cars and carts. A pedestrian-oriented design excludes personal cars and carts at individual homes so that residents will be free to stroll without safety or traffic concerns. An on-site concierge center with dedicated Chileno Bay Club staff will be imminently available to manage the needs of Point Villa residents, including baggage handling, transportation support, and Club activities. 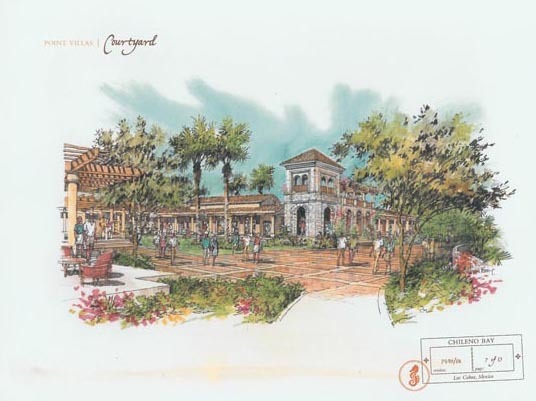 A lushly landscaped pedestrian corridor will provide access for Point Villa residents to the Beach Club, courtyard, other residences, and the Vehicle Stable. 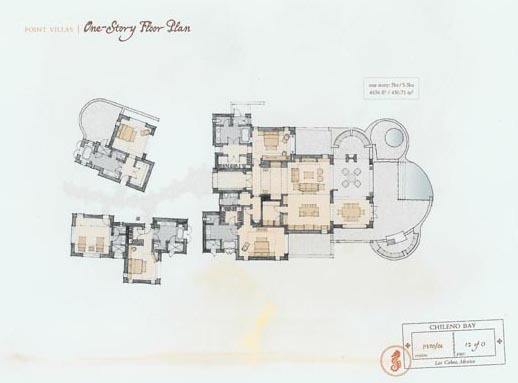 Residences feature gourmet kitchens, luxurious master suites with outdoor terraces, and dining and living areas situated to experience the full drama of the ocean view and spaciously designed to maximize entertaining opportunities. All Point Villas include private courtyards that provide a shady, relaxing sanctuary to escape. 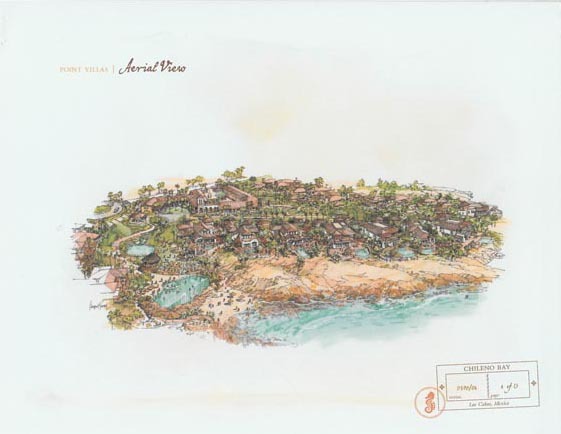 As part of the community design of the Point Villa neighborhood and in keeping with the overall philosophy of Chileno Bay Club, residents will enjoy access to central gathering spaces and service areas. A club “living room” provides a large entertainment space for community gatherings, special events, or “game day” activities; this is further serviced by a fully equipped catering kitchen and bar. The community fitness center with studio space, a separate work-out equipment area, and men’s and women’s locker room facilities serves as a neighborhood hub for health and wellness. A well-appointed business center provides the technology and supplies necessary for staying in touch. An expansive pool complex provides a fresh-water swimming area with oceanfront views. This will include an infinity-edge pool with swim-up bar for adults, as well as a family pool designed with a beach-entry kid’s area and space for lap swimming. A well-stocked snack bar provides the perfect spot for a quick treat or a family picnic. 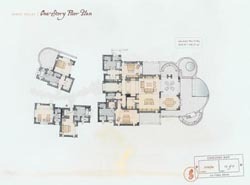 Seaside terraces provide residents serviced private and community lounging areas for sunning and relaxation. Price : To be announced. Please call for pricing.